Photo: If you want to carry a camera at all times in your pocket or purse, look at a smaller camera, such as the Canon Digital Elph series or the Kyocera/Yashica Finecam S3. For flash photography with a clunky point and shoot, pick up a camera with a hotshoe (e.g., Canon G1). 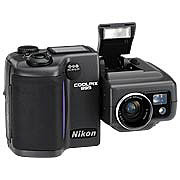 For photography of fast-changing scenes, get a more responsive single-lens reflex digital camera such as the Olympus E-10, the Canon D30, or one of the Nikon D1s.